At the end of another sunny and rather warm day, I was happy to have ticked off most of my list - I had almost done removing the rasperry suckers, weeding the areas I was working on as I went along, so the only task that remains to do is to fertilise once the suckers are all removed. 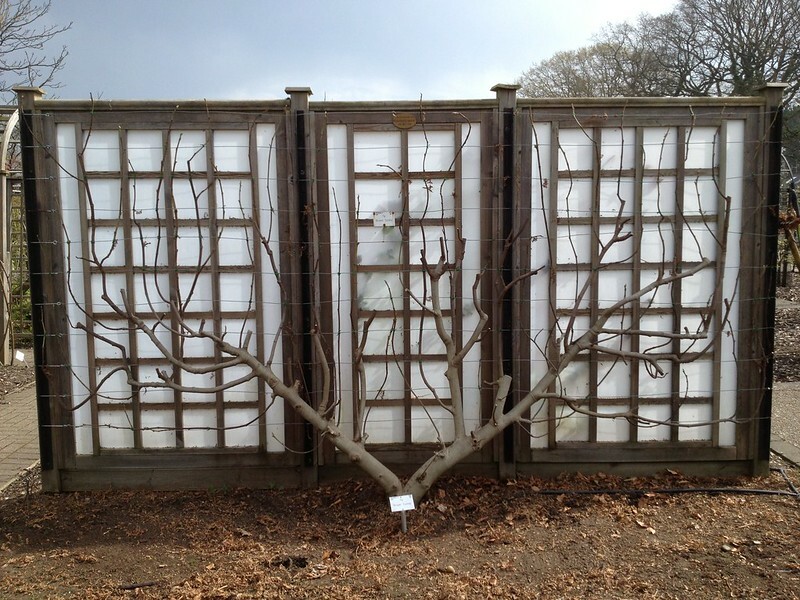 After we dressed the fig ('Brown Turkey') at the end of November, it was good to have the opportunity to take it out of its winter shelter, weed around it, and leave it in all its beauty for the visitors to see. 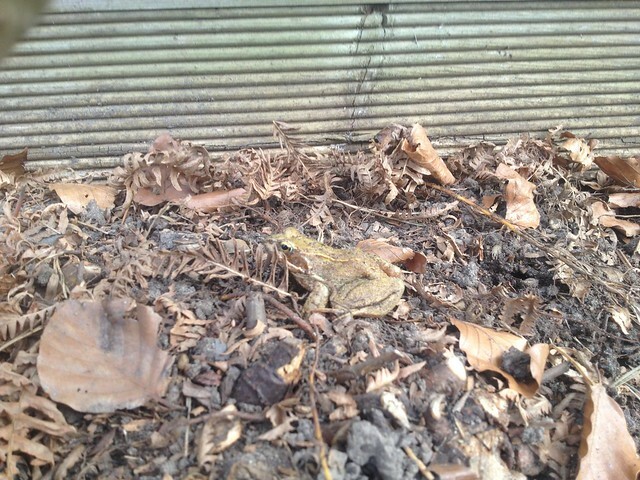 I also found a frog in the process, hiding in the bracken at the feet of the tree. 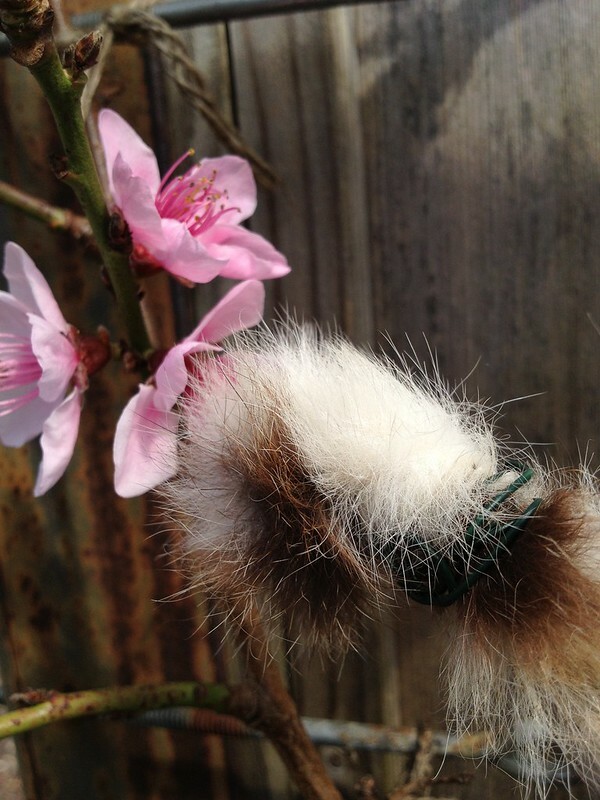 I had never hand pollinated a tree. It is usually done for one of two reasons: breeding purposes (so as to control the parents of plants) or for lack of suitable pollinators - for a variety of reasons, for example artificial growing conditions, including under-cover crops (as is the case of our peach, protected from rain by a wood and polythene frame) or even in case of decline of natural pollinators compromising crops (as is happening in apple and pear orchards in China). Armed with a rabbit's tail on a stick (the source of some bemusement, even amusement, in passing visitors), I removed the frames and proceeded transferring pollen from one flower to the other. The procedure has to take place on a warm, sunny day, and it was done before today: in fact, the flowers were mostly at petal fall stage, but we wanted to be sure that we got all the flower we possibly could. 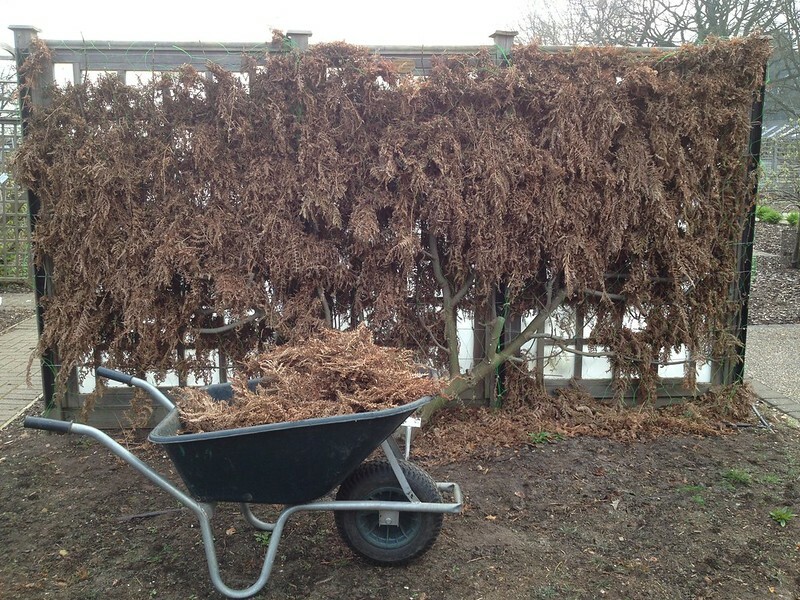 It is a laborious task! The frames then went back on: they'll stay until May. I did finish the day digging out those pesky raspberry suckers, running away from supporting poles and wires. There is some left for me next week, but I could not go home before picking the forced rhubarb, as it is supposed to go into a cheesecake for the team, that I'm baking at the weekend! 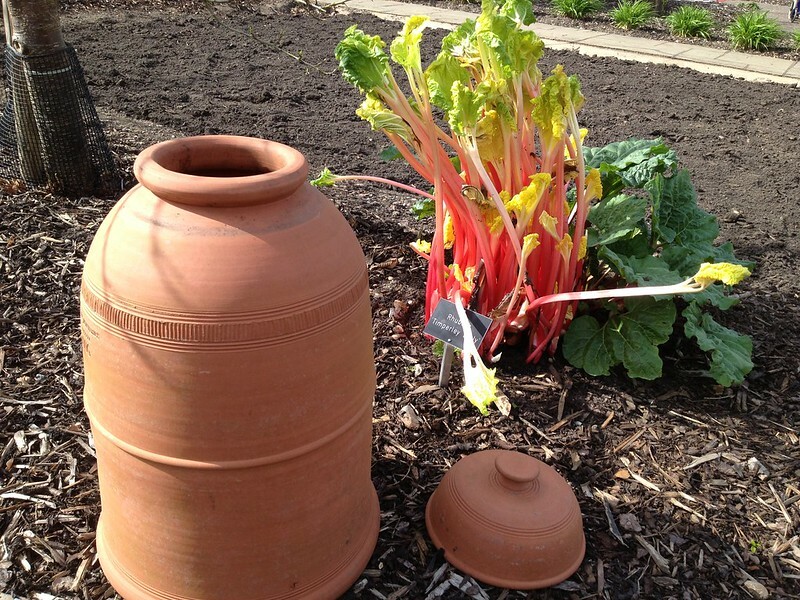 This was another first for me: I have never forced rhubarb, mainly because those terracotta pots they use are rather gorgeous to look at, but awfully expensive. So I removed the lid (it had been pushed up by the long stems!) 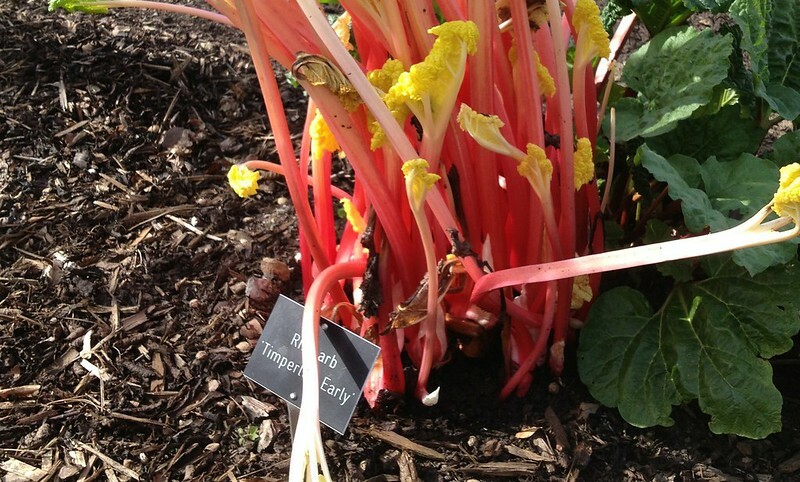 and then the pot with some excitement: forced rhubarb is considered such a delicacy. 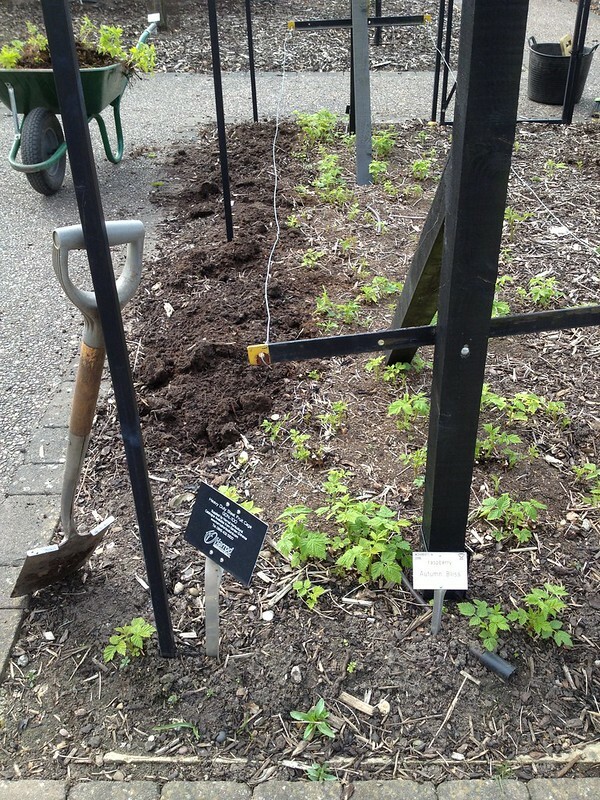 I then understood why they say that forcing rhubarb kills the plant, and (as you can see in the picture above), we never force more than half a plant here at Wisley. Or divide one in half first, then force only one of the two. The stems were beautiful, but very delicate - as you would expect of etiolated plants. When you tried to pull them away at the base, they either broke or ripped away the whole of the bud, which was really slimy and soft, as if on the point of rotting. Some of the leaves were also starting to rot at the top: the enclosed environment is not ideal, you should not leave anything too long in such conditions. Depending on the variety and the situation, in fact, forcing takes 5 to 10 weeks. This pot had probably been on just too long - but nothing that will spoil our enjoyment of the cheesecake! By the way, I was told a plastic pot, surrounded by straw to keep the temperature more even inside would do just fine, although I suppose it would put it at bigger risk of rotting, because plastic is less porous than clay, so keep a closer eye if you do try. It's because of the dry spell!